Translation is tricky, as you know if you’ve read any web page automatically converted by Google Translate; different tongues have different nuances that are hard to teach to an algorithm. Specifically, the way languages handle gender varies, and these discrepancies previously led to Google Translate to make assumptions and provide potentially inaccurate translations. Now, though, when gender is ambiguous in a translation input, the output will show both masculine and feminine terms, eliminating the guesswork. Before, inputting a phrase that could have either a feminine or a masculine interpretation would provide only one translation, and Google would try to parse the appropriate gender by looking at context. This method wasn’t very accurate, as it had to assign genders to ungendered words. For example, the gender-neutral English word “professor” would translate to “profesor” in Spanish — which is technically accurate, but only if the professor you’re talking about is a man. Now, Google Translate shows both masculine and feminine translations, letting users choose which is appropriate. 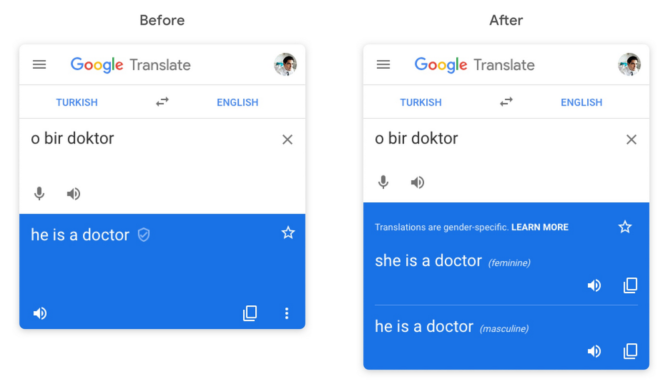 The Google Translate website — on desktop and mobile — currently provides gender-specific translations for English words translated to Spanish, French, Italian, and Portuguese, and for phrases translated from Turkish to English. Google says it’s planning to extend the functionality to more languages and other platforms (like the Google Translate app) soon.